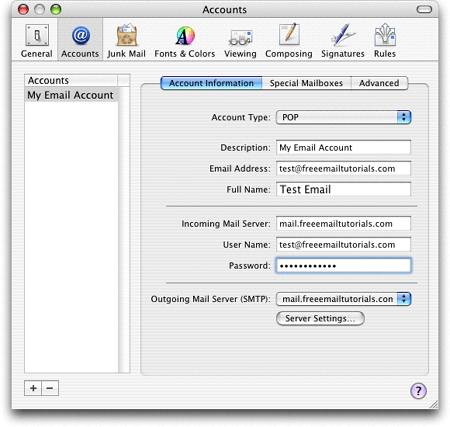 You can add email accounts in Apple Mail from the Preferences window. Go to Mail > Preferences, then click on Accounts. You should see the list of pre-existing email accounts. At the lower left corner of the window, click the (+) sign button to create a new email account. • Description - This field lets you pick a friendly name for the email account you are adding. 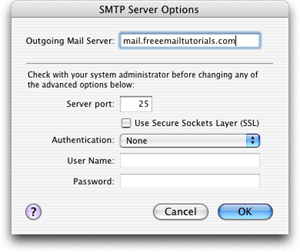 You might need to double check your mail server's configuration with your email provider, but most likely, the options shown above will work. Most email providers do not require that you authenticate yourself more than once per session → Authentication set to None. AOL, a notable exception, forces you to use port 587 instead of port 25 when you use a non-AOL email account but AOL as Internet Service Provider (ISP).